Seven Seas is a new residential project consisting of 44 properties. There is a choice of 2, 3 or 4 bedrooms apartments, and 2 and 3 bedroom penthouses, distributed across just three buildings. 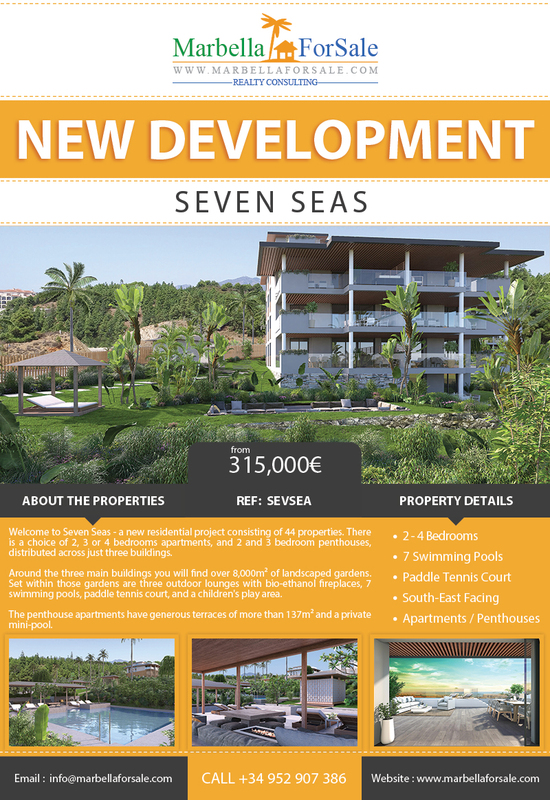 Welcome to Seven Seas – a new residential project consisting of 44 properties. There is a choice of 2, 3 or 4 bedrooms apartments, and 2 and 3 bedroom penthouses. Around the three main buildings you will find over 8,000m² of landscaped gardens. Set within those gardens are three outdoor lounges with bio-ethanol fireplaces, 7 swimming pools, paddle tennis court, and a children’s play area.